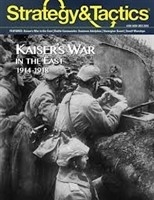 Kaiser’s War in the East is a strategic level simulation of World War I on the Eastern Front, 1914-17. This is a two-player game; One player controls the Central Powers, the other player controls the Allies. The concept of “victory points” (VP) is central to play of game. Players begin each scenario with a designated number of VP. They gain new VP as a result of achieving objectives; they lose VP when they lose units in combat. They may expend them to gain reinforcements and carry out certain actions. To win the game you must have more VP than your opponent, so play is a balancing act between expending VP and attaining objectives.